Praia Vermelha is one of Rio’s smallest beaches but also one of the most scenic. Tucked inside a protective cove that keeps the waves at bay, the beach is covered in coarse sand with a slightly reddish hue. Flanked by the spires of Morro da Urca and Morro da Babilonia, Vermelha Beach offers ground level views looking up at Sugarloaf Mountain. To reach the top of the iconic peak, ride the cable car from Vermelha Beach to the top of Morro da Urca, before transferring over to a second car to the top of Sugarloaf Mountain. Or, to combine a hike with the ride to the top, a steep trail ascends Morro da Urca from the sands of Praia Vermelha, which is accessed by walking the paved walking trail that leads away from the beach. Known as the Pista Cláudio Coutinho, the trail offers stunning vistas and photo ops looking back at the reddish-hued beach, and for a Rio moment you’ll never forget, visit the beach in the hour before sunset to watch as the fading sun illuminates the cliffs and the shoreline in red. The easiest way to reach Vermelha Beach is by hiring a private taxi, and the kiosks in the park across the street offer affordable food and drinks. The water here isn’t great for swimming, although it’s the sand, sun, scenery—and Sugarloaf—that draw nearly all of the crowds. Get a personalized introduction to sprawling Rio de Janeiro on a private, full-day tour that covers the famous beaches, landmarks and cuisine of Brazil's most vibrant city. Skip the stress of getting around on your own and let a private guide whisk you around to highlights like the Christ the Redeemer statue, Tijuca Forest, and the Maracana football stadium. See the famous beaches of Copacabana, ride the Sugar Loaf cable car, dig into lunch at a Brazilian steakhouse, and more. See Rio at sunset from 1,200 feet (356 meters) above sea level from the top of Sugarloaf Mountain. Choose to travel to the summit by cable car or on foot - if you’d prefer to take a scenic hike to the top. Then sit back and watch the city lights twinkle on as the sun drops into the ocean. See panoramic views of Rio de Janeiro bathed in the golden glow of sunset and leave all of the hassles and logistics of driving and navigating to your private guide. Venture up Sugar Loaf mountain by way of a hillside pathway above Guanabara Bay. A specialist guide provides climbing equipment and technical support for the final vertical ascent 65 feet (20 meters) to the summit — no previous experience required! This unforgettable hiking tour rewards you with views of Copacabana Beach and Morro Dois Irmãos (Two Brothers Hill). Descend the easy way aboard the aerial cable car. Upgrade to venture with your own personal guide on a private tour that includes round-trip hotel transport. 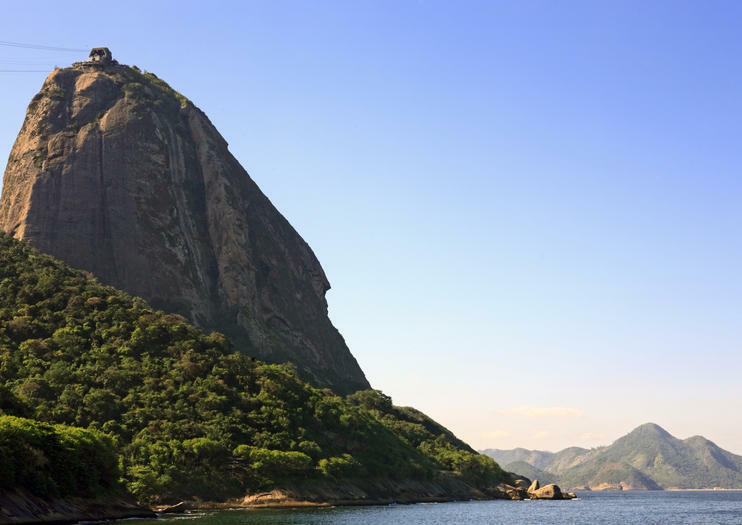 Visit Morro da Urca in Rio de Janeiro on this biking and hiking tour. Ride along the promenade of Copacabana beach on the way to Morro da Urca. There, hike up the first hill to catch views of the surrounding landscape. Following that, you can choose to take a cable car to Sugar Loaf Mountain (cable car ticket not included in price of tour). Discover the captivating natural beauty amid the urban sprawl of Rio de Janeiro on a 3-hour bike tour with an expert guide. Visit iconic landmarks like Sugar Loaf Mountain and Copacabana Beach, stopping regularly to listen to informative commentary and capture excellent photographs. Gaze at the resplendent Christ the Redeemer statue on his cliff-top perch; cycle alongside the gorgeous Ipanema Beach; and enjoy the shaded serenity of the area surrounding the Rodrigo de Freitas Lake. Combine visits to Rio de Janeiro's top landmarks and highlights on a single full-day tour. Stops include the Sambadromo, the Christ the Redeemer Statue, the Tijuca Rainforest, and others. Buffet lunch and round-trip hotel or port transportation included. Discover the spectacular sights of Rio de Janeiro the alternative way on a leisurely 3-hour bike tour of the beguiling Brazilian city. Follow an expert guide along a route brimming with monumental landmarks and natural beauty; cruise along the blissful promenade beside Ipanema Beach; gaze at majestic views of the Rodrigo de Freitas lagoon; and marvel at Rio’s most iconic attraction, the statue of Christ the Redeemer. Stop regularly to capture photographs and listen to captivating commentary from your expert guide. Discover the main tourist attractions of Rio de Janeiro on this private guided tour. Start at the summit of Corcovado Mountain to visit the iconic Christ the Redeemer statue. Then, head to Rio’s southern beaches, followed by a cable car ride up Sugar Loaf Mountain. This tour can be conducted at your own pace and adapted to your interests. Cycle a few laps of Lapa, Botafogo, Urca and the Red Beach during this 5-hour bike tour through some of Rio de Janeiro’s most charming neighborhoods. Pedal from your starting point at Copacabana beach towards the beachfront hangout of Botafogo and the upscale Urca area. After sticking your hands in the red sands of ‘Praia Vermelha’ (Red Beach), you’ll admire the historic Arches and Selaron Steps of bohemian Lapa. A guide, bike and helmet and safety briefing ensure a fun, safe ride. The sunset seen from Guanabara Bay, from inside a comfortable and safe boat with 2 decks, two bathrooms, diving deck and a qualified crew makes the experience of navigating at dusk unforgettable. The exuberant skyline of the city of Rio de Janeiro formed by its topographic diversity with different mountains and forests allows an indescribable panoramic view. The breeze, the sun, the sea, the unique landscape with the soundtrack of your choice is the best recipe to experience the sunset in Rio de Janeiro! You will know how our city was founded, go to places where runners from Rio de Janeiro train and get to know some of the cultural and natural attractions of the city, such as the Sugar Loaf and the best Sunset of Rio de Janeiro. (all of this we will do running on flat floor for 8km and we hike uphill for 1km) At the end of this experience of getting to know our city while doing your daily workout, you will be able to tell everyone why Rio de Janeiro is considered the Capital of Outdoor Sports. =D Meeting Point: Praça Paris: Av. Augusto Severo, 342 - Glória, Rio de Janeiro - RJ, 20021-040 (Entrance Gate) Meeting Time: 5 p.m. Distance: 9km Floor: 8km by asphalt + 1km by trail Duration: 2,5 hours to 3 hours Tour end: Praça General Tiburcio, Urca (in front of cable car station) Our tour depends on the season. That's why it is possible to make a slight change in the start time of the tour. Paraty has 65 islands and hundreds of beaches of rare beauty, surrounded by a lush vegetation that makes it a quiet and unforgettable place. The most traditional Paraty Tour, the Schooner Walk, includes four stops (two beaches and two islands), approximately 40 minutes each, one of them for optional lunch (à la carte) on board.In these Parades it is possible to go snorkeling and snorkel, taking advantage of the crystal clear water of this region. One of the most requested stops by our tourists is the famous Ilha Comprida. This island is also known as Natural Aquarium of Paraty, due to the huge amount of fish that surround the boat and people who dive into the sea during the tour.Our boats are accredited with total comfort and security and approved by the captania of the ports and they have an excellent infrastructure so that your tour is even more comfortable and unforgettable. Hike to Morro da Urca, then ride the aerial cable car the rest of the way to Sugar Loaf mountain on this half-day tour. Follow your guide on a forest trail to the twin granite domes and be rewarded with sweeping views of Guanabara Bay and Rio’s UNESCO-listed landscape from the summit. Upgrade to venture with your own personal guide on a private tour that includes round-trip hotel transport. It is our most requested Tour for telling the best of each and still count on the exuberant beauty and tranquility of the Cagarras Islands. Private Tour.It is our most requested Tour for telling the best of each and still count on the exuberant beauty and tranquility of the Cagarras Islands. Kayak to Cotunduba Island from Praia Vermehla on this 4-hour eco-adventure in Rio. Get a lesson on paddling technique and basic safety from your expert kayaking guide, then take off for the island, located 1 mile (1.8km) offshore. Explore the island, part of an environmental protection area, and learn about the local flora and fauna from your guide. Get panoramic views of Corcovado and Sugar Loaf mountains, Copacabana and Ipanema beaches with Dois Irmãos hill, and Tijuca Forest in the background. Use of all kayaking equipment is included; you must know how to swim to participate in this tour. Round-trip transportation from central Rio hotels is included. Pedal a bicycle around the bustling Brazilian capital on this 5-hour bike tour of Rio de Janeiro. Explore landmarks and highlights in an interactive, physical way with your informative cycling guide. Visit areas of the city such as Botafogo, Cinelândia, Lapa and Tiradentes square, listening to informative commentary as you travel. All cycling equipment is included.